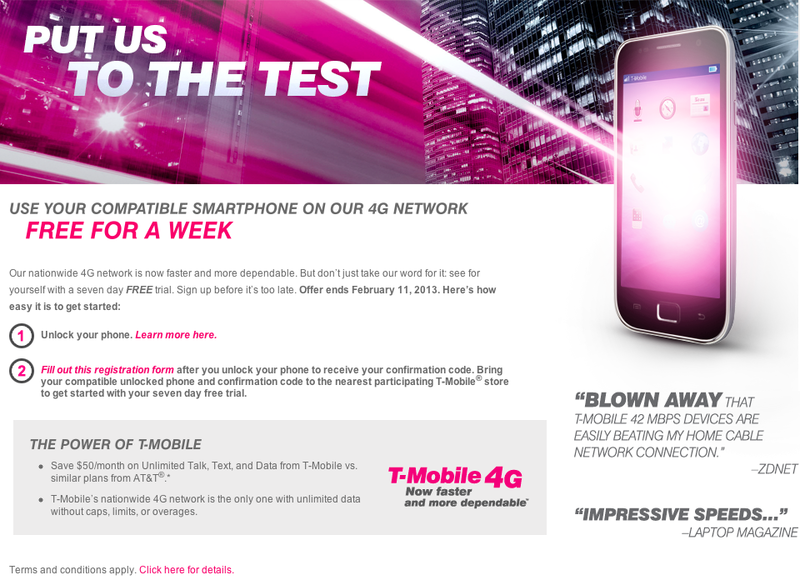 T-Mobile’s let loose a quiet promotion for residents of Seattle and Las Vegas in the past few weeks and with it coming back onto my radar, we can only hope this deal extends to other markets in the future. T-Mobile isn’t keeping this one under any sort of wraps as my memory was refreshed after a @tmobile retweet last night by someone taking advantage of this opportunity. According to the T-Mobile.com landing page for this 7 day FREE trial, you must bring an unlocked device and fill out a registration form. A compatible unlocked phone is of course required and given the restrictions surrounding that now, we’ll just let you figure out how to handle that one on your own. Regardless, it’s pretty clear based on this page that T-Mobile is still eager to grab some AT&T customers and directly going after them. 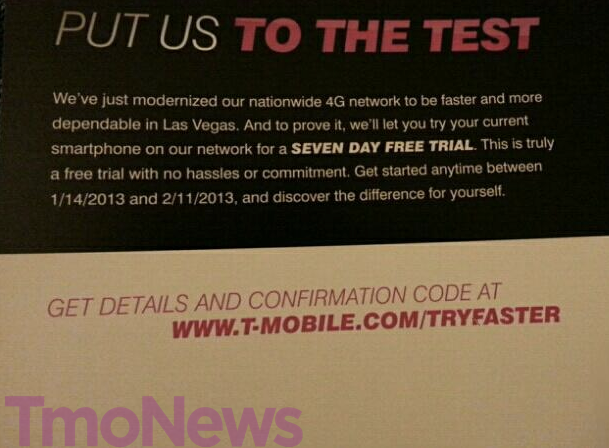 Seattle and Las Vegas residents can hit www.t-mobile.com/tryfaster for more details. ← First T-Mobile LTE Speed Tests Spotted In Kansas City? “We modernized our nationwide 4G network…” But you can only try this in Seattle or Las Vegas. The rest of the nation isn’t ready yet. What confuses me is the fact that after the 26th, it became illegal to unlock your phone. So does that mean it became illegal to “illegally” unlock your phone and you can still have it done but it has to be approved by the carrier? Or is T-Mobile saying piss on the law??? Any phone purchased prior to January 26th is exempt for this ludicrous law. As far as the affected phones are concerned, they can be unlocked with carrier’s permission. for = from. Typing too fast! It is not illegal if you get the phone unlocked from the carrier. It is illegal if you unlock the phone by other means like ie. Jailbreak, paying someone to do it. This also only has to do with phones that are being bought after the 26th. Before the 26th you are grandfathered in. I bought my galaxy note 2 from Tmobile $780 and said I had to wait 60 days and some other stuff. Thank you Tmobile next time I buy a Nexus UNLOCKED+NO CONTRACT & CHEAPER. ok, THIS is a good idea…. I think I mentioned it a while back! I have 3G speed on my iphone in Providence, RI so RI was updated not just Las Vegas and Seattle. Those two cities will probably get LTE speeds first, I bet. Boston and some surrounding suburbs also have the 1900 radio up and working. I have an AT&T SGS2, I unlocked it, put in my T-Mobile sim card and bang I’m getting over 10mb down and around 4mb up on T-Mobile. In that same area I would be lucky to even get 4mb down on AT&T. This area is not yet listed as being live, Boston might be considered live but the Suburbs are not and it is everywhere. Every day they add more towers, it is very exciting if you are a long time T-Mobile customer. If you have this service in your area, try it, the prices are fantastic and speeds are very fast.